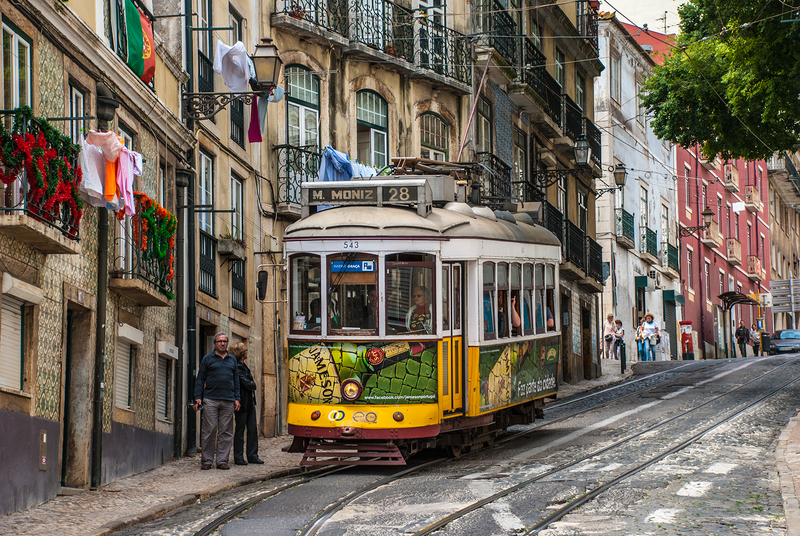 The Lisbon tramway system was opened on 31st August 1901 and completed a year later. 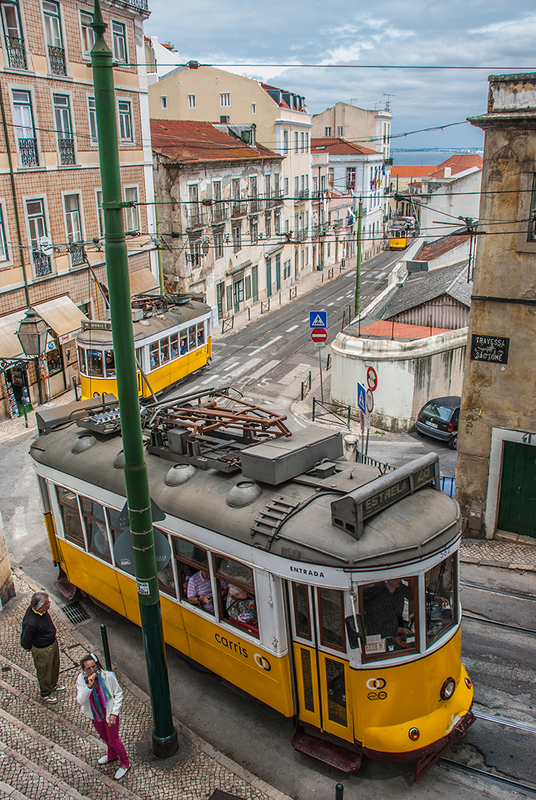 Today, riding the trams is one of the most popular tourist attractions of Lisbon. 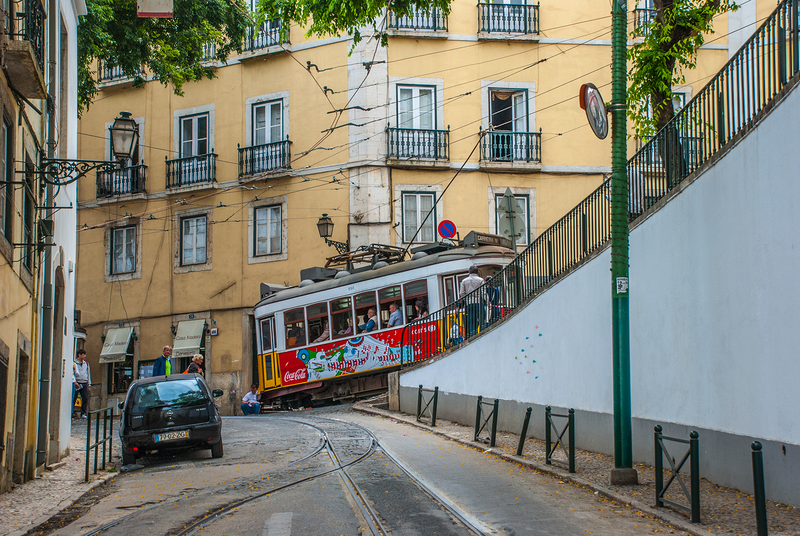 Climbing over 250 feet from the city centre to Largo da Graça the route includes a spectacular collection of rising and falling gradients, tight bends and streets so narrow passengers can touch the walls of buildings as they pass. 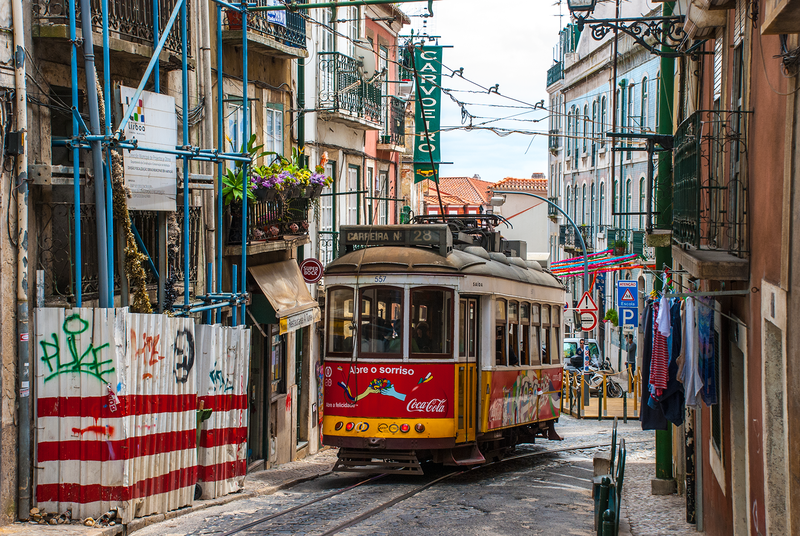 Although motor vehicles are allowed on these same narrow streets access is controlled by traffic lights. 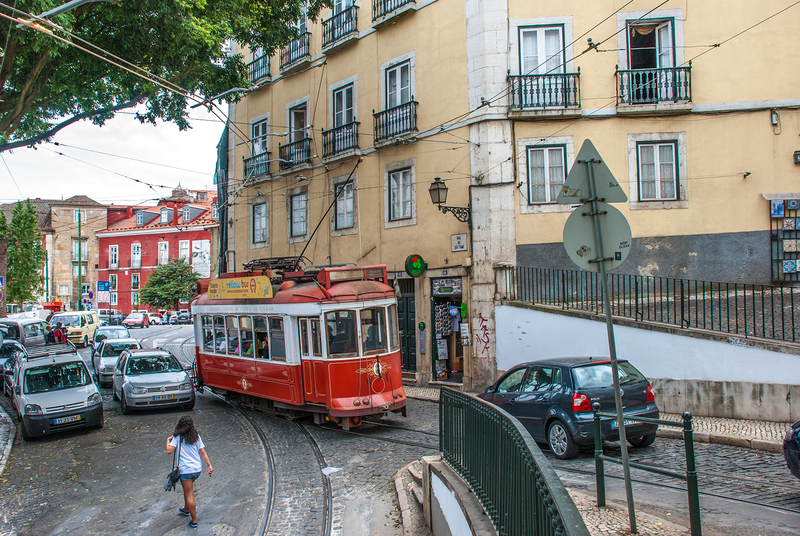 All cars on the Graça Circle route are four-wheel 'remodilados' like car 557 here working downhill at Calçada São Vicente. 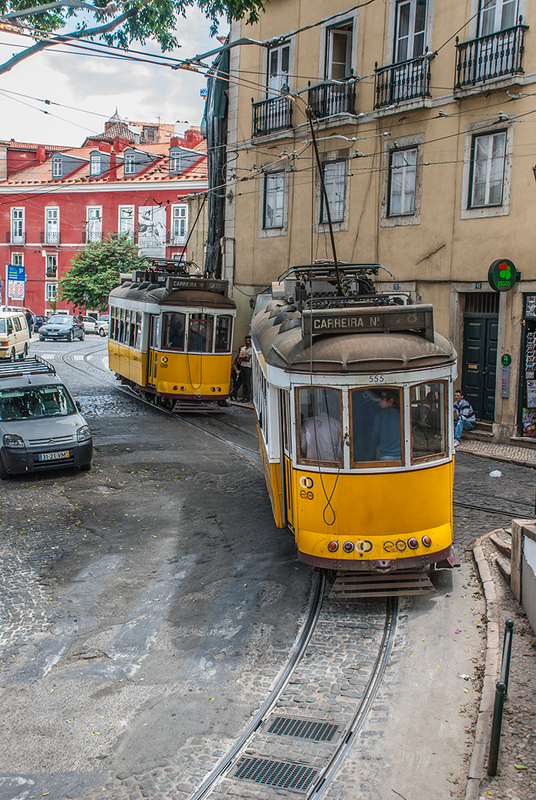 Remodilado cars 556 and 566 seen here working uphill at Escolas Gerais were both built at the Santo Amaro works in 1931 and rebuilt in 1996. 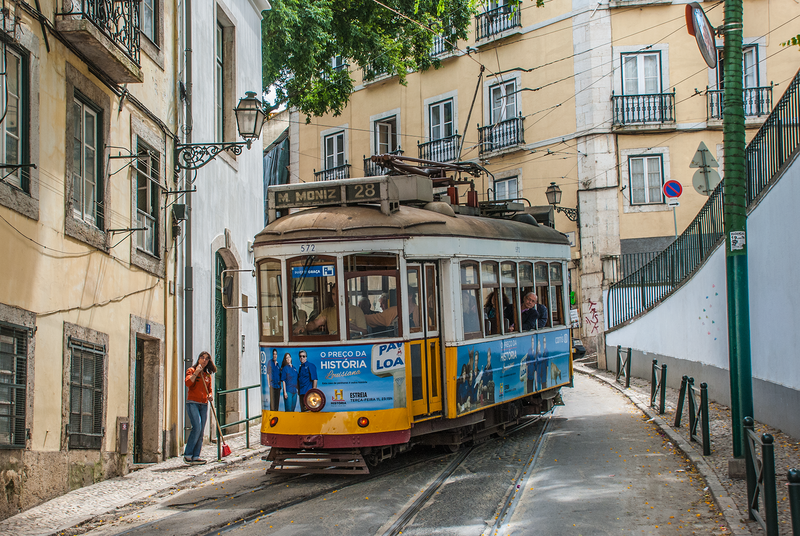 Car 557, a Remodilado car, working downhill at Calçada São Vicente. Negotiating the junction of Escadinhas de São Tomé and Travessa São Tomé car 555 threads through other road traffic as it heads toward the city centre. 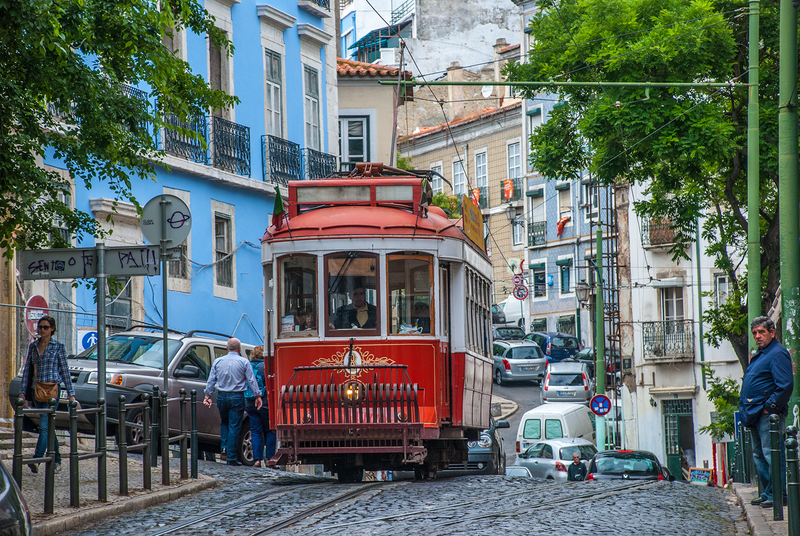 Car 543 descending the two-track section of Calçada São Vicente on its way back to the city centre. 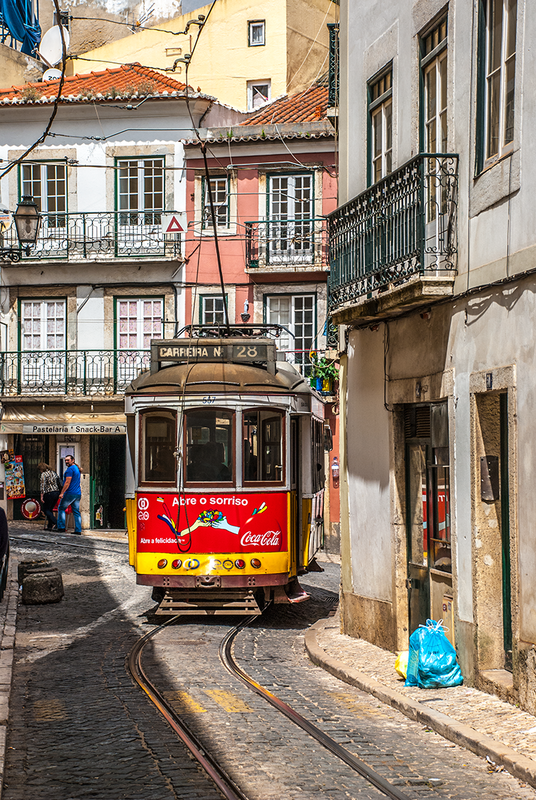 Car 572, working downhill to Prazeres on the west side of the city, enters the single track section of Calçada São Vicente. On the corner of Escolas Gerais remodilado car 562 heads away from the city centre to Graça. 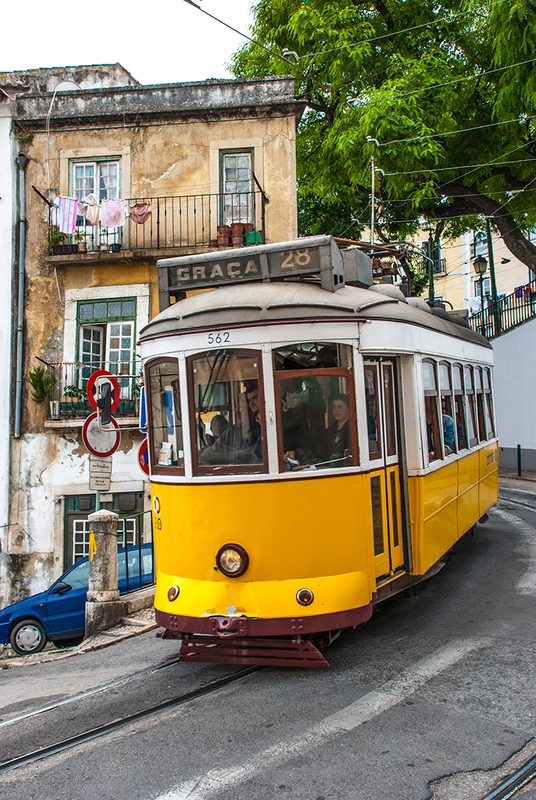 Such is the demand for tourist rides and in view of the traffic controls on the Graça Circle, cars often run quickly and in convoy with only metres in separation to effect the minimum delay. 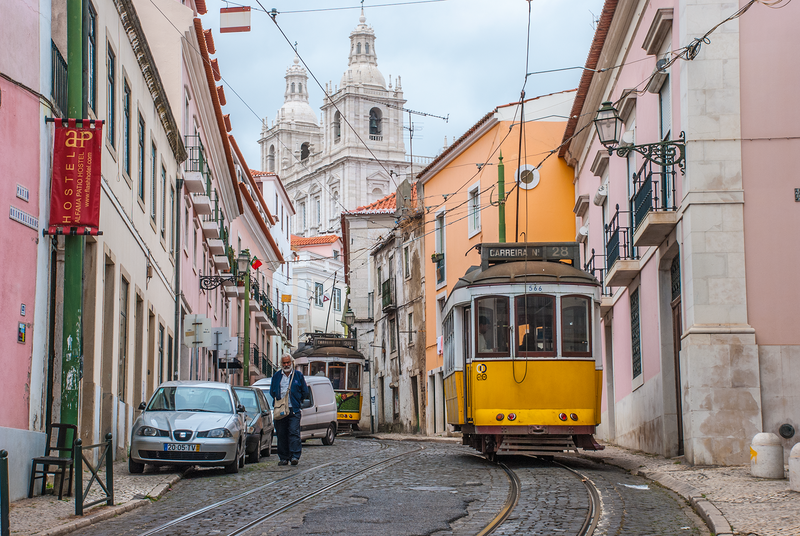 Cars 543 and 557 are here running together and navigating the tight corner at the corner of Calçada São Vicente and Escolas Gerais. Car 558 at the junction of Beco Funil and Rua São Tomé heading towards the city centre. 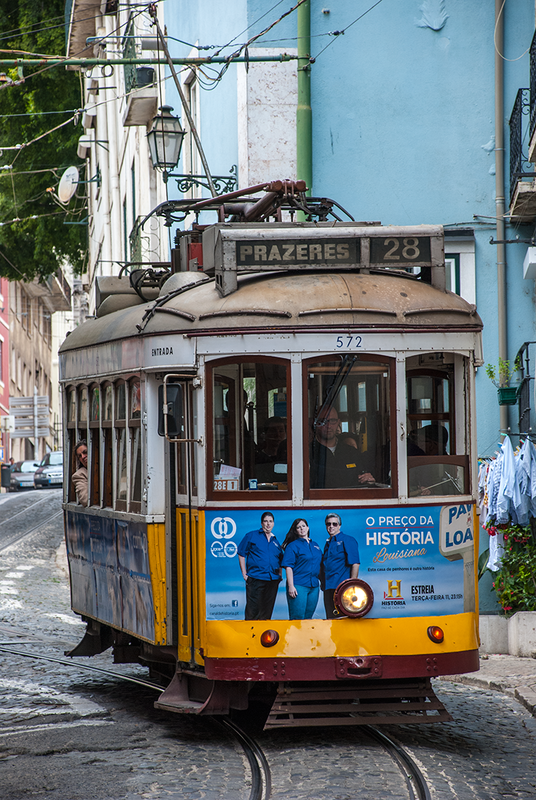 Sight-seeing charter car 8 on Rua São Tomé. 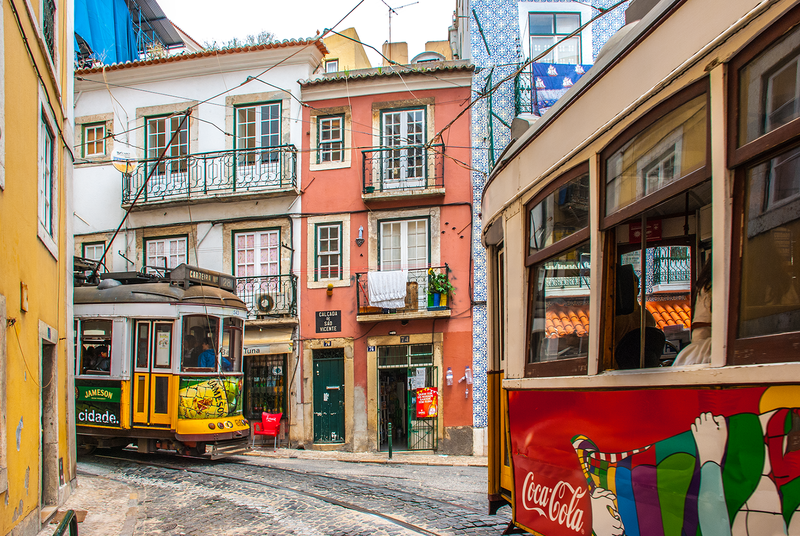 Demonstrating just how closely tramcars and motor cars operate throughout the city, car 8 negotiates the junction of Beco Funil and Rua São Tomé heading towards the city centre. Running in a three-car convoy, cars 562, 555 and 552 approach the junction of Escadinhas de São Tomé and Travessa São Tomé en-route for the city centre. Clear passage through the junction with relatively little other traffic. 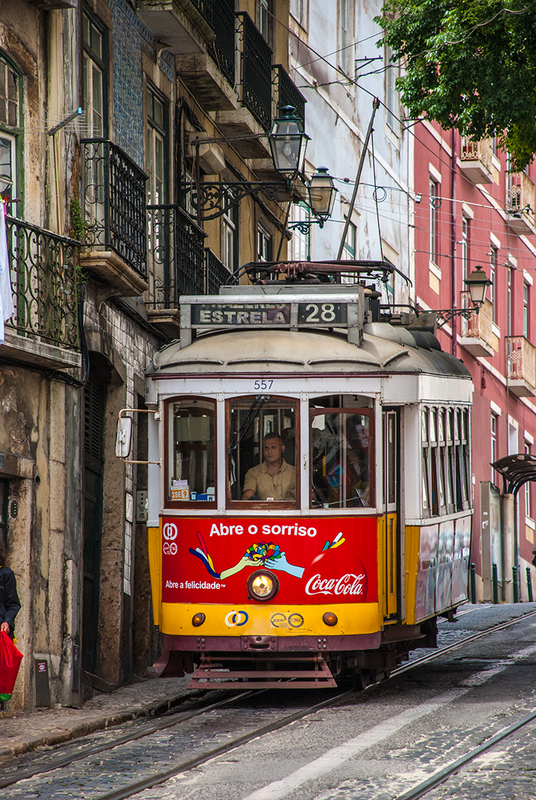 Car 572 working towards Graça but showing a destination of Martim Moniz. 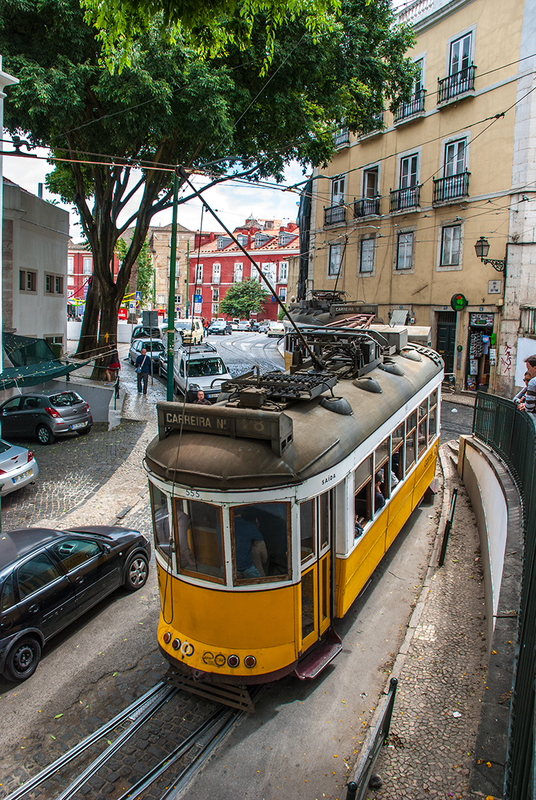 Car 557 passes the snack bar at Calçada São Vicente and climbs towards Graça. 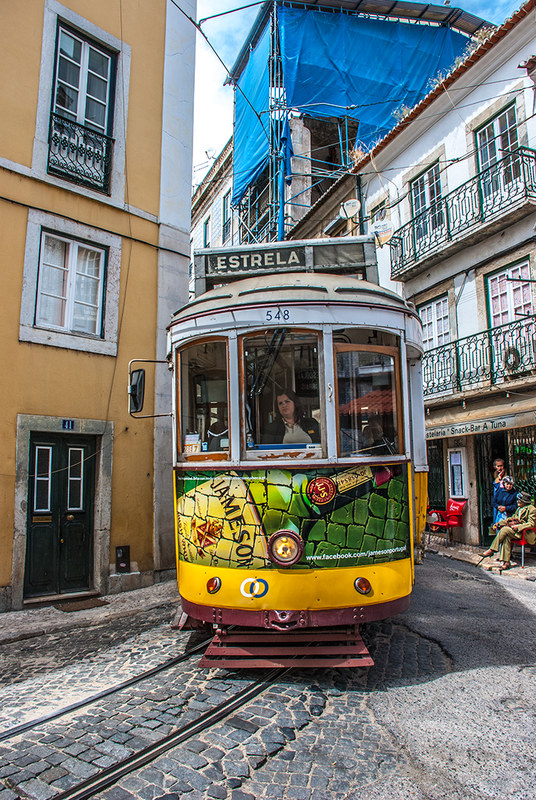 Heading for Estrela on the west side of the city, car 548 negotiates the corner of Calçada São Vicente and Escolas Gerais.